With rising cost pressures and a tightening labour market, business confidence fell in Singapore over the third quarter of this year. According to findings from the Global Economic Conditions Survey (GECS) - conducted by the Association of Chartered Certified Accountants (ACCA) and the Institute of Management Accountants (IMA) - only 18 per cent of respondents reported confidence gains in Q3, down from 26 per cent previously. In their joint report, ACCA and IMA said the loss of confidence was mostly down to reduced prospects for Singapore businesses. ACCA senior economic analyst Emmanouil Schizas said: "A number of factors have come together to hinder the confidence levels of Singapore's businesses in their own prospects. Inflation is close to its Q1 highs once again, while pressures on demand and cash flow are up again, ending a full year of improvement. 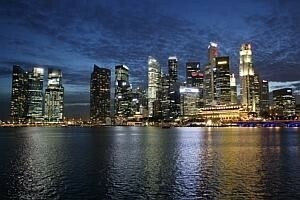 "Late payment symptoms, usually more of a problem elsewhere in the world, have reached Singapore. Meanwhile, growth capital has also become less accessible, after supply peaked in early 2013. "This is not a trend unique to Singapore but one quite common to the wider region. Neighbouring Malaysia has also seen confidence drop off and businesses are seeing a number of challenges, while a deepening credit crunch in China could have implications for Asia Pacific in general." Negatively tinged perceptions of the broader economy hovered at the same levels of the preceding quarter; 55 per cent of finance professionals surveyed here believe the economy is deteriorating or stagnating, while 35 per cent believe it is improving or about to do so. "That perception has not changed significantly since the second quarter of 2013," said Leong Soo Yee, head of ACCA Singapore. Despite the challenging environment, business capacity building continued to recover for a third quarter in a row, having bottomed out in late 2012. "This trend, however, may be driven by new restrictions placed on foreign labour and the need for new hires. If that is the case, the boost to overall business capacity may be small and short-lived," ACCA and IMA said in their report. On a global level, GECS showed the best economic sentiment since the survey began in 2009, marking the first time that the number of optimists have outnumbered the pessimists. However, Q3's good news was "disproportionately weighted towards Europe", as the continent showed improved perceptions of a broader economic recovery. Fieldwork for the Q3 instalment of GECS was carried out between Aug 15 and Sept 4, and drew 2,021 responses from ACCA and IMA members around the world, including 154 from chief financial officers. The survey was sent out to 7,000 finance professionals in Singapore; 44 of these responded. Said the report: "Fieldwork was concluded before the US government shutdown of October 2013 could become a significant concern."